100th day of school is a children’s educational app that can help with their reading. The pages will turn with a book like animation. Tap on the words and have them read out loud. The words reappear in larger font and each word being said is highlighted in red. Tap Elmo and he’ll ask you some questions. You’ll have to go through your Nokia Lumia’s Marketplace app. 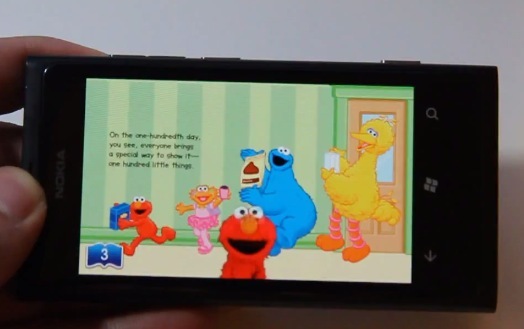 Join Elmo in an interactive read-aloud experience! Every day at school is filled with new and exciting experiences. Now you can celebrate school with all your favorite Sesame Street friends. Join Elmo, Zoe, Abby Cadabby and others as they experience the 100th Day of School. Are you ready? Let’s go to school! « Video: Nokia 808 PureView: 5 years in the making – (Shot on Nokia 808 PureView) + Sample pics!